There are two different types of handle commonly used on modern windows. The first type is called cockspur. 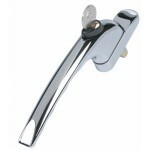 This type of handle is the main type used on aluminium windows but they are also used on some older PVC windows. The second type of handle is the espagnolette handle or espag handle for short. This is usually found on PVC windows. 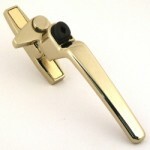 We carry replacement handles to suit windows from the last thirty years. We can replace your broken or lose handle in one visit. Most modern PVC windows are secured by an espagnolette locking system. This is an internal lock with 2 or more locking points. As with any metal moving parts, it is recommended that they are oiled a couple of times per year. 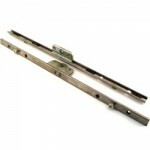 When an espag lock breaks, the window may appear to be locked securely but actually may not be! The window handle will usually move in the normal way but you will find that the lock is not responding. The broken lock must be replaced. 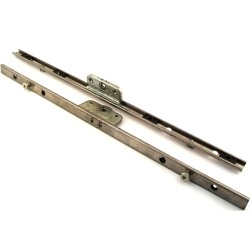 Ambassador window repairs carry an extensive range of espagnolette locks with over 70 different make, models and sizes, so we are sure to have a lock to suit your window.